I recently decided to start taking care of my real nails rather than applying acrylic nails like I’ve done since I was 13 years old. I stocked up on vitamins and I’ve been monitoring my water intake. I also make sure to file and mositurize my nails on a daily basis. Now that I’m starting to achieve the length I desired I’ve begun experimenting with different nail polish colors. During my recent trip to Sally’s Beauty Supply I couldn’t resist picking up a few bottles of FingerPaints Nail Polish! Their vibrant color selection caught my eye more than any of the other brands they had available. I was also very happy to see that they promise fast-drying because I always seem to ruin my nails before they are able to dry. Other benefits of FingerPaints Nail Polish are long wear, a high gloss finish, and smooth application. All of which were right on the money! I have definitely become a raving fan! I made sure to pick up a few extra bottles for our loyal readers so here’s your chance to give them a try! Three lucky readers will receive their very own bottle of FingerPaints Nail Polish! Leave a comment below letting us know your current nail care routine and if you win will you keep it for yourself or use it as a stocking stuffer? Subscribe to GLAM Gyrlz by entering your email address at the top of the side menu. Follow GLAM Gyrlz on Twitter and leave a comment below for an additional entry. Blog about this giveaway and then come back and leave a direct link to your blog post. You MUST add a comment for each of your entries. The winner will be selected by a Random.org based on the comment numbers. Contest ends on Wednesday, December 1st at 12:00am. Winner will be announced Wednesday, December 1st by 5:00pm. I’m super excited about this find! Aren’t these the most adorable tweezers you’ve ever seen. While standing in line at my local Sally’s Beauty Supply store I noticed these little cuties next to the register and just had to pick up a pair. Any GLAM Gyrl knows that tweezers can really come in handy between eyebrow touch-ups. Want a pair of your very own? Well here’s your chance! 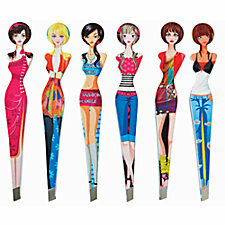 Three lucky readers will receive their very own pair of Lady Tweezers! Leave a comment below letting us know what you think of these cuties. Will you keep it for yourself or give it away as a holiday gift? Subscribe to My Glam Squad by entering your email address at the top of the side menu. Contest ends on Friday, November 19th at 12:00am. Winner will be announced Friday, November 19th by 5:00pm. Velocity Facial Cleanser deep cleans your face, tones to refresh and exfoliates. Plus, it contains a lighter version of the Velocity® fragrance. Couple that with the Velocity Lightweight Moisturizer which softens and has oil-absorbing ingredients, and you’re all set for beautiful moisturized skin. A must in the colder weather months. Leave a comment below letting us know why you should win this amazing facial set. Will you keep it for yourself or give it away as a holiday gift? Register as a Mary Kay customer for personalized product recommendations. Follow My Glam Squad on Twitter and leave a comment below for an additional entry. Contest ends on Monday, November 15th at 12:00am. Winner will be announced Monday, November 15th by 5:00pm.